Due to size constraints most modular robots are heavily geared down and although this allows them to apply a higher torque they are generally slower and have for the most part demonstrated only kinematically stable gaits. We have designed CKbot to be fast so that we can research dynamic locomotions, one of our main research interests here at the ModLab. We are aiming toward inexpensive modules to fulfill one of the three promises of Modular Robotics, the other two being versatility and robustness. The last design requirement was to make CKbot small enough to fit through a three inch pipe. These three inch pipes are often found in buildings so designing CKbot small enough to crawl through such a pipe would make it more suitable as a search and rescue robot. CKbot’s size resembles a cube 6cm on each side. A summary of the hardware components for the current design of a single module is given in the following table. There are two types of CKbot modules as shown in the figure below. 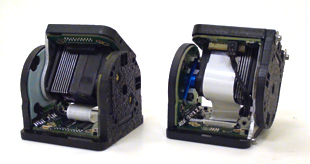 A U-bar module on the left and an L7 module on the right. The two modules are very similar having one rotational degree of freedom with a slightly different kinematic structure. The U-bar is made up of a U-structure and a bar, the L7 is composed of an L-shaped and a 7-shaped structure. This difference enables modules to connect on different rotational axis. Other modules that can be attached include IR proximity sensors, a gripper module, even a smart camera module developed by Babak Shirmohammadi, and Dr. Camillo J. Taylor, also at the Grasp Lab. Bluetooth and Xbee modules can be plugged in to connect a cluster of CKbot modules to a laptop using wireless radio. Modules can be connected manually using 3M screws and can be connected electrically to share power and communication on a CAN (Controller Area Network) bus using a 20 pin header. Modules that are on the same bus are called a cluster. Clusters can communicate amongst each other using infra red (IR). There are seven IR pairs on a module that act as transmitters and receivers. Bluetooth and Xbee modules are used to connect via wireless and translates messages to and from the CANbus. Self re-Assembly after Explosion: CKbot is a modular robot that can put itself back together. Dynamic Locomotion of CKbot: Demonstrating the different types of dynamic locomotion gaits of CKbot such as rolling and legged locomotion. Configuration Recognition with CKbot: Using basic principles from graph theory to create and implement an algorithm on CKBot that automatically recognizes its configuration. Distributed IR Communication Fault Tolerance: A triple modular redundancy approach for CKBot units to collectively vote on observations and execute commands in the presence of infrared (IR) communication failures. M. Yim, P. J. White, M. Park, and J. Sastra, “Modular self-reconfigurable robots,” in Encyclopedia of complexity and systems science, , 2009, pp. 5618-5631. Sep 24, 2009 | Filed under CKbot, Uncategorized.